Marquis first started collecting records at the age of 15. His first job was at an antique store with a section of records that set off the retro-active chain of events that would change his life, more or less. It started with a Johnny Cash record, Live At Fulsom Prison. Thru the route of early country music that led to Emmett Miller while Cliff Edwards was introduced by a friend with a bargain bin cd. Pre-war jazz flooded his ears and he was joyfully treading water. In 2002, Marquis' band, Hobo Jazz, was formed with no big bravado but a lot of eager charm. Culling it's selections from all sides with an emphasis on early country, blues & jazz along with originals in a decidedly vagabond vein. He traded his acoustic guitar for an upright bass in 2004 to fill the spot of an absentee hobo. Teaching himself how to play by listening to early Willie Dixon records & studying the techniques of Pops Foster, Bill Johnson, and the tuba lines off many early jazz recordings. 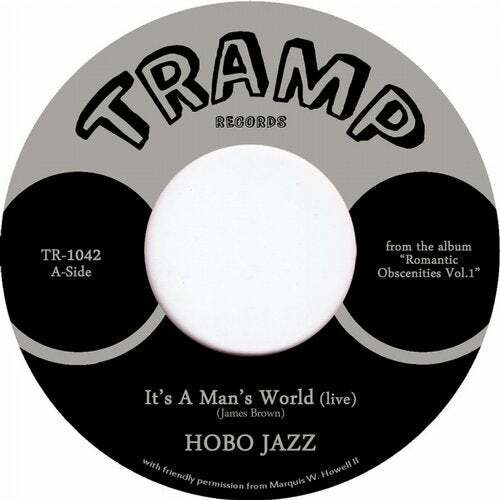 Tramp proudly presents the debut 45rpm single by Hobo Jazz! "It's a Man's World" was recorded live at the New Years Eve Show 2009 at The Piano Bar in Hollywood while "One Glance (At the Jolly Roger)" is taken from their studio album "The Curse Of Tramp Life".